Warm balmy evenings signal the start of lighter eating which means that it’s well and truly time for salads and making the most of fresh seasonal produce. 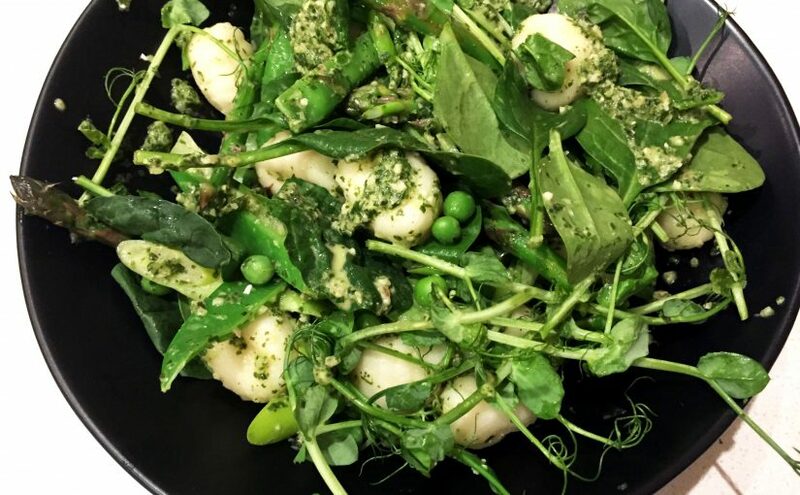 I love the combination of all these fresh green vegetables – really you can use whatever is at hand: broad beans, snow peas, baby spinach leaves. 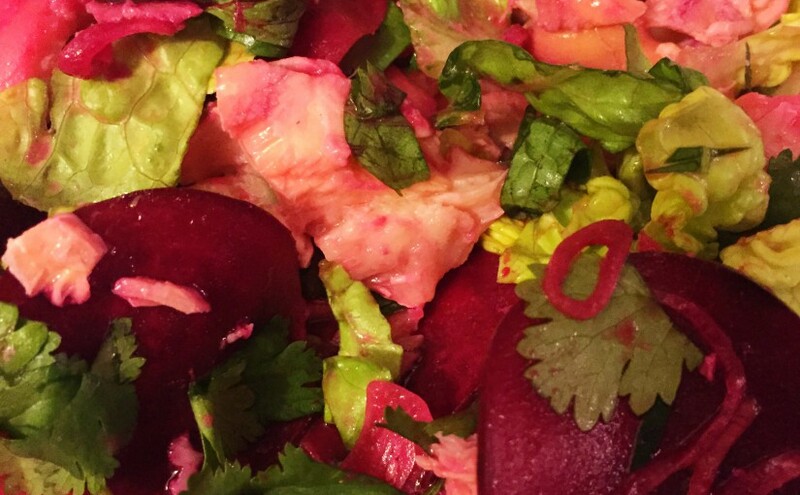 The addition of the gnocchi turns this salad into a very sustaining and satisfying meal. Put all the ingredients into a small blender and blitz until smooth. Add a bit of water if the dressing is too thick. Bring a pot of water to boil, add 1tsp salt then add the zucchini. After 30 seconds add the asparagus. 30 seconds later, add the sugar snap peas. Cook for a further 30 seconds then throw in the frozen peas. Drain immediately and refresh with cold water. Place gnocchi with all the greens into a bowl and pour over the dressing. Toss well to coat all over. Sprinkle with freshly ground black pepper. 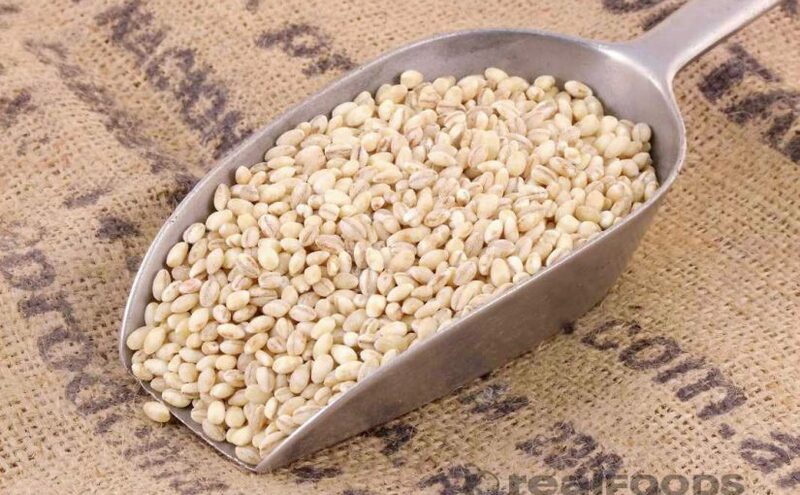 Divide onto 2 plates and sprinkle with the pinenuts or pistachios. *Generally all you need to do is bring a pot of salted water to boil and throw in the gnocchi. Once the gnocchi rises to the top of the pot cook it for a further 30-40 seconds and then it’s ready. I don’t eat cakes (just don’t have a sweet tooth) but I do enjoy making them. Recently I’ve been making cakes and taking them to the yoga studio to share with the lovely teachers there. It’s a win, win for all – they love the cakes and I get pleasure making them. 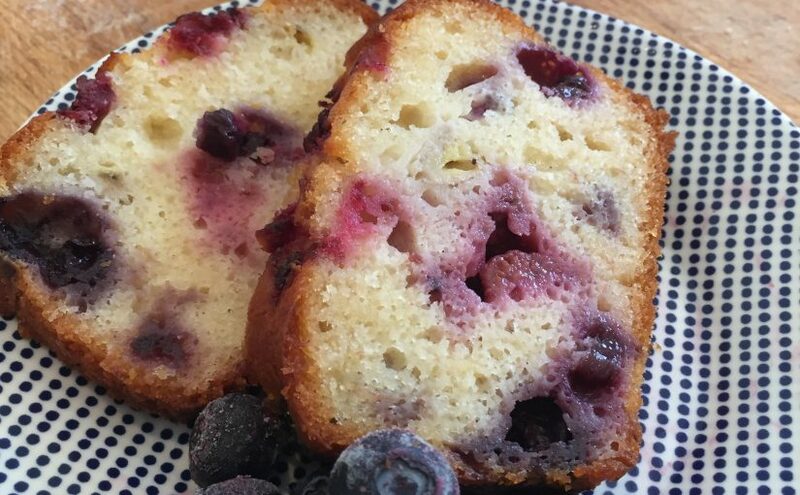 This berry and banana loaf is a fabulously easy cake to make – no butter to beat, no appliances to wash. Just one bowl. And perfect for those leftover bananas that look too ripe to eat but stay in the fruit bowl. Preheat oven to 160c. Grease and line a loaf tin (22 x 8 cm) with baking paper. Place the yoghurt, oil, eggs and sugar in a bowl and whisk to combine. Sift flour and add to the mixture, stirring until just combined. Fold through the banana and berries. Spoon mixture into the lined tin and bake for about 1 hour and 15 minutes. 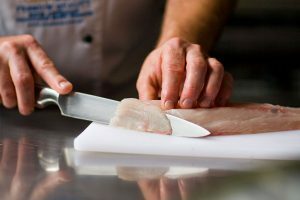 To test, insert a skewer into the middle. If it comes out clean, it’s ready. I also find that when the cake starts to shrink away form the edges of the tin, it’s usually done. My good friend sent me some home-grown shiso leaves along with a recipe for eggplant which I cooked the other day. 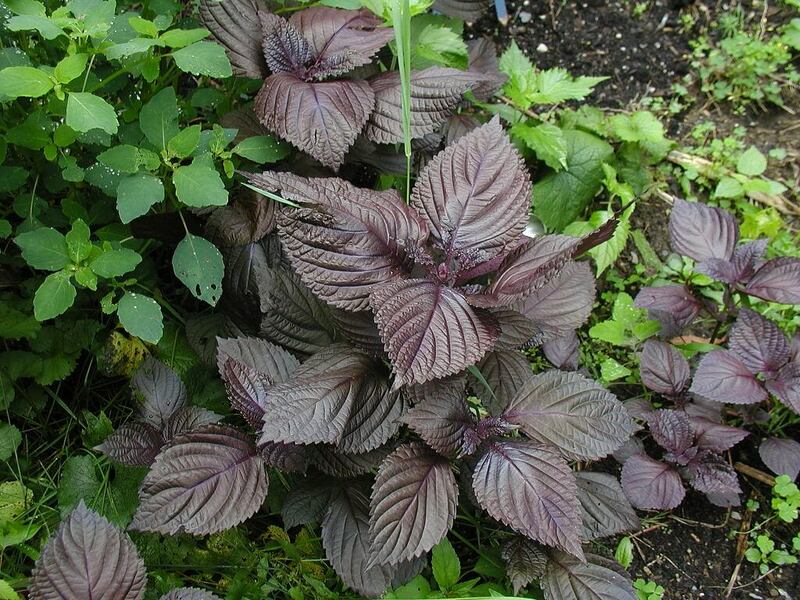 Shiso leaves aren’t available here where I live but I must search out a plant I can grow as it’s a wonderful herb. I’ve only ever used the tiny ones that are sold more as garnishes with raw fish dishes (perfect with sashimi) but I love their flavour and was interested in the eggplant recipe that made use of them. 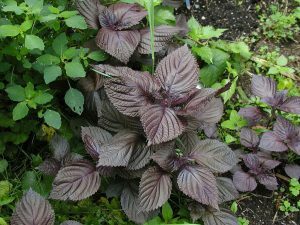 Shiso is a member of the mint family and has large teardrop-shaped leaves with serrated edges. It comes in both a green and reddish purple form. It’s also known as Japanese basil, perilla and beefsteak. The original recipe doesn’t call for mushrooms but I couldn’t resist the large portobellos I spotted at the market and they go really well with the eggplant. I served this with some basmati rice topped with wasabi furikake (seasoning). Cut eggplant lengthways into 2.5cm-thick wedges, sprinkle with salt and stand in a colander for 10-15 minutes. Thickly slice mushrooms. Rinse salt from eggplant and pat dry with paper towels. Heat a large frying pan over medium heat, add some vegetable oil and shallow-fry eggplant in batches until golden-brown on both sides and tender (6-8 minutes), adding oil as necessary. Transfer eggplant to a bowl. Add some more oil to the frying pan and saute mushrooms until golden but still firm. Add to the eggplants and pour soy marinade over to marinate at room temperature (1 hour). 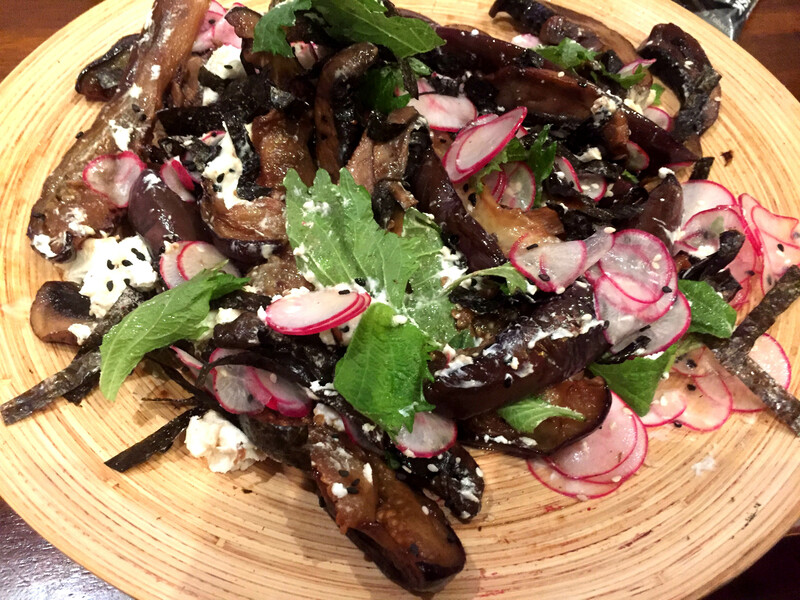 To serve, drain eggplant and mushrooms from the marinade and arrange on a serving platter, dot the goat’s curd around, scatter with sesame seeds, radish, nori sheets and shiso leaves and serve topped with the katsuobushi. *Katsuobushi are bonito flakes, available at Japanese grocers. I couldn’t get any goat’s curd so I used some soft goat’s cheese instead. Ditto with the Katsuobushi – I had some bonito seasoning that I use to make dashi stock and sprinkled that over the dish. It may have not looked as pretty as in the recipe but it tasted sensational. I also didn’t read the recipe properly and instead of tearing the nori I shredded them. Oh well, next time I’ll know and plan in advance. 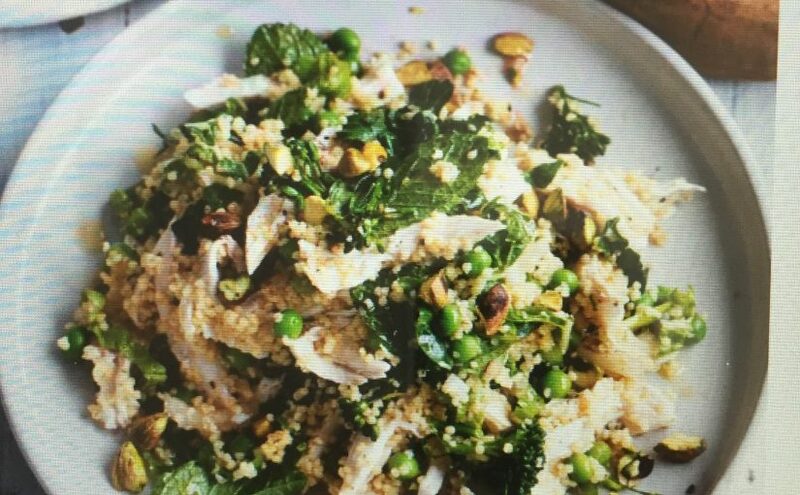 Nevertheless, I do encourage you to try this dish – it’s very easy to make and you won’t be able to stop eating it. Good news: I’ve just found an online seed place that sells shiso and have put in my order! 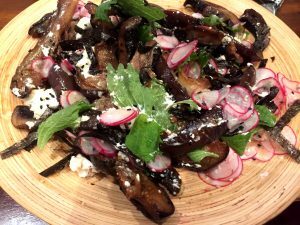 Posted on February 17, 2017 Categories Cooking, foodTags cooking, eggplant, food, shisoLeave a comment on In praise of shiso – and eggplant. Not wanting meat or fish I wondered the aisles of the supermarket in search of inspiration. Nothing. And then it came to me: risotto. But what kind? The vegetables were uninspiring but I spied some lovely Portobello mushrooms and remembered I had a packet of dried wild mushrooms in my pantry. Sorted. It’s been a while since I made a mushroom risotto. I think it’s one of those dishes that has gone out of fashion (risotto in general). But it’s such an easy and tasty dish to make. 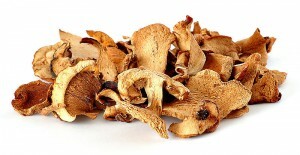 All you need to do is soak the dried mushrooms in hot water for a couple of hours. The longer you soak them the stronger the flavour. I soak them in about 2 cups of water and then I use the liquid as the basis of my stock for the risotto. This time I finely chopped the Portobello mushrooms and also added some sliced dried shiitake (also soaked in some hot water) so that I had a variety of sizes, textures and of course, flavours. The recipe is easy – in fact there is no recipe. All you need to do is chop a brown onion and saute in some olive oil then add 1 cup aborio rice and stir to coat. Add a handful of chopped Portobello and pour in some warm stock (I had some vegetable stock I had made on the go). Meanwhile I heat some olive oil and sauté the rest of the Portobello mushrooms with some thyme and a sprinkling of salt and pepper, just to brown and soften. Remove these from the heat to add toward the end when the risotto is almost cooked. Back to the risotto: keep adding stock (which includes the wild mushroom liquid) and stir risotto occasionally and gently until it’s al dente. Then add the soaked fungi, shiitake and browned Portobello. Stir in some butter, extra olive oil and you’re done. Finally, add very finely shaved parmesan and a good grinding of black pepper. So easy. It’s a very rich dish so a good accompaniment is a salad of greens including rocket, beetroot leaves and radicchio. Perfecto. Pickles – who doesn’t love pickles? I’ve been a pickle fan ever since I was a kid. My pickles of choice back then were GeeVee sweet & sour pickles. I would consume these by the jarful and even drink the juice. Since then I have evolved in my taste for a preference for good dill pickles and am constantly on a search for the perfect dills. More recently I have started to make my own and now have become something of a pickling queen. What began with classic dill-style cucumbers has now developed to pickling just about everything – no vegetable is exempt. There’s always a jar of some sort of pickles in my fridge. 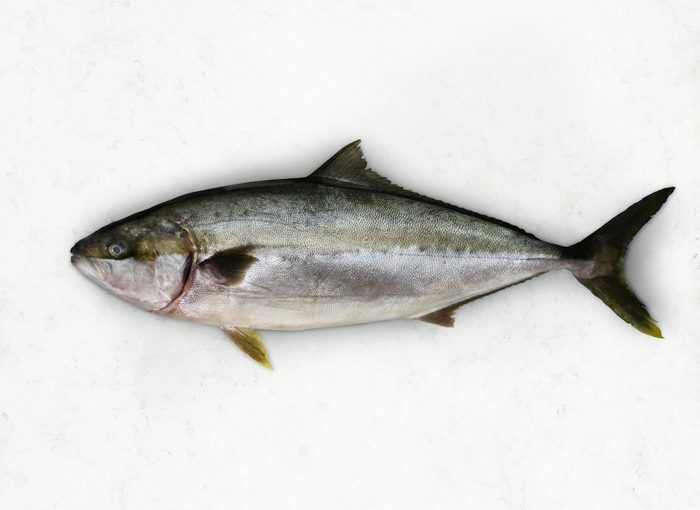 They’re a delicious addition to salads and smoked or raw fish and are quick and easy to make. Even better, they can be ready to eat in just half an hour. I first tried my hand at finely sliced radishes and then moved on to baby onions and button mushrooms and fennel. Inspiration hit me when I encountered pickled grapes served with pate; they were a revelation and I thought I could easily make them. I now have a jar in my fridge which is always on the go. They’re delicious and hard to resist popping into your mouth. 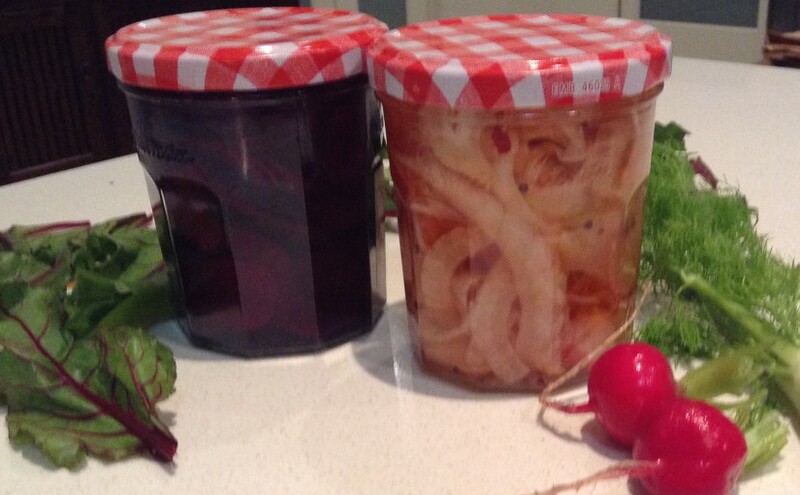 More recently I have pickled baby beetroot, finely sliced on a mandolin, these too are ready in no time. The great thing about pickling your own vegetables is that you can make up just one jar at a time and you don’t need to do it days in advance – just an hour before hand is fine. The other day I bought some lovely cherries with the idea of pickling them. Alas, before I could decide on an appropriate flavour profile I ate my way through all the cherries.